Alyssa once called me a “yeast whisperer.” I love baking with yeast — no-knead bread and flatbreads make regular appearances in my kitchen and challah, herb-speckled dinner rolls, baguettes, and babka emerge from the oven on special occasions. A few weeks ago I was looking over the recipes I’ve made over the course of this project and I realized I hadn’t pulled out my yeast once. It was high time to correct this oversight. 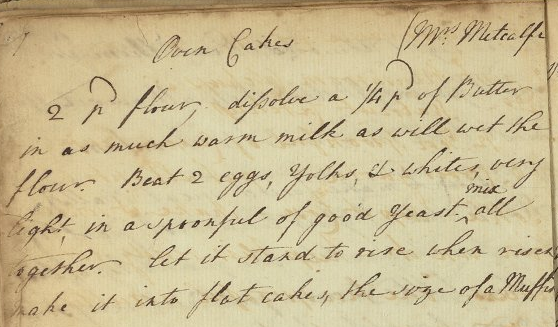 This recipe for “Oven Cakes,” fluffy leavened rolls, comes from Ms Codex 644. I wrote about this manuscript a few weeks ago about in our “Cheape Soupe” post and these rolls would certainly pair with that soup. This recipe makes a delicious and versatile roll that could accompany soup, add to a dinner spread, provide a foundation for a fierce sandwich, or make a mean midnight snack. As a yeast baking aficionado, I need to do additional research on the status of yeast in the eighteenth century, before Pasteur identified it as a living organism. My normal sources had very little information on how one would add a “spoonful of good yeast” to this recipe in the 1700s. I assume wild yeast and something like a sourdough starter may have been involved. The dried yeast I rely on certainly would not have been available. In addition, what we now call “English muffins” are (still) simply called “muffins” in the UK. I flattened the cakes into round disks based on what I know about muffins and the recipe’s clear instructions. The only thing I added to this recipe was salt. (And, honestly, I’ll likely add some more salt the next time I make them.) I halved the original here and it made eight rolls. Measure all ingredients. Melt the butter, heat the milk, and lightly beat the egg. In a large bowl, mix together flour, butter, and milk until combined. Add the egg, then the yeast. The mixture will be sticky, moist, and somewhat unmanageable. I didn’t knead this dough, but I did stir it vigorously. When everything is well-combined and the dough is smooth, if unwieldy, cover with a towel and leave to rise in a warm place for an hour and a half. When the dough has risen and springs back to the touch, preheat oven to 400 F. My dough didn’t quite double in size, but it did plump up nicely. Divide the dough into eight rolls and pat into round disks. Butter two baking sheets. Leave ample room between rolls. Bake for 10-15 min, until golden on the top and firm on the bottom. Try to let the rolls cool down before eating them. Serve warm. I devoured these. I ate the first one hot out of the oven. It smelled vaguely yeasty, but it was buttery and delightful. After the first few bites, I brought out my current favorite spreads: Lydia Pyne‘s strawberry jam and “Three Citrus Marmalade” made by the local Fallen Fruit from Rising Women project. I ate some rolls with almond butter for breakfast: I ate some more with leftover chilli for dinner. This is a recipe that will make a return appearance in my kitchen. I look forward to making a batch with chopped fresh herbs, nuts and dried fruit, sprinkled with seeds, and/or brushed with an egg glaze. As a fellow food historian, I am so glad to see you keep trying out the old recipes. This one sounds very tasty and worth making. I too share your desire for salt in bread dough. I guess it’s just what our taste buds are used to. I noticed that the original recipe separates the eggs and beats them well–an old technique for increasing air bubbles in food. I wonder if your dough would have been lighter if you had included this step? I checked Hannah Glasse’s receipt for muffins and she talks about using ale-yeast in great detail. Since the yeast in your recipe may well have come from the brewer, I think this was a quantity known to the 18th century housewife. The English also had a technique for drying a yeasted paste and preserving their leaven that way, but generally I see references to pints of ale yeast. Books edited by either Elizabeth David or Karen Hess may give you the details you are look for. In addition, Mrs. Glasse flattens her dough and makes these muffins on a griddle over the fire rather than baking them. That would surely produce a different result. Hers sound like what we know as English Muffins, complete with the big pockets for pooling the melted butter. You have inspired me, and I will have to make English Muffins again some time soon. Thanks, Mercy! Glasse was the one book I realized I forgot to check before I posted! Thanks for sharing all these thoughts. I’m inspired to make them again soon. Thanks, Kim! I’ll contact you via email. I don’t know if this will be helpful, but back in the 1950’s and 1960’s, the mom and pop grocery stores sold small cubes of moistened yeast called cakes. They were wrapped in a printed aluminum foil that could be purchased individually. As soon as you opened the cake, you would get a very strong whiff of that yeast smell. My mother would crumble it with her hands as she placed it in milk to dissolve getting yeast remains left on her fingers like gooie dough. These were available in the supermarkets until at least the late 1970’s that I last looked for them. I vaguely remember that my elders knew how to make there own yeast. Wish I could give you more information, but this is all I have. Personally, I have never used yeast! It can cause all kinds of diseases if consumed in large quantities, such as Candida, etc. My Mom has great stories about yeast cakes, too! It’s interesting how the normal delivery of common supplies can change so much in a (relatively) short time. Yeast cakes are still available in grocery stores. Look in the refrigerator section near eggs, usually. This recipe interests me because of a family baking tradition at Christmas. We make kuringer rolls, recipe via a gourmet club my mother was once part of. They’re Greek in origin, and we were told by a friend of Armenian heritage that her family had a similar roll. Milk and eggs and margarine, but also sugar, no kneading. Roll golf ball sized pieces of dough into a rope and coil around itself, tucking the end under. Brush with beaten egg, sprinkle with sesame seeds, bake. My mother would disown me if I shared exact details. I have the proportions memorized, and can never remember a Christmas when I didn’t help make triple batches. I’m certain that “kuringer” is a derivation and not the correct name. Google has never revealed anything similar. This is a fascinating conversation. Are any of you followers of William Rubel’s Facebook blog “Bread History and Practice?” It full of conversations just like this, and even more academic, involving people all over the world who are interested in the history and practice of bread making. I bet there would be someone who could tell you more about the history of “kuringer”.